The Milton Ulladulla Vintage and Classic Car Club held their Harbour Classic Rally on Saturday 28th & Sunday 29th of July. Sunday’s activities included a Show and Shine event held between 9:30am & 11:30am at the Ulladulla Harbour. 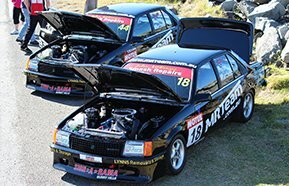 MRTeam was honoured to join the club on Sunday for the Show & Shine event, showcasing our 2 V8 Holden race cars and 4 car custom built transporter. The MRTeam transporter was a big hit with tours through the inside of the trailer and corporate area proving very popular. The turnout of vehicles in support of the event was commendable. The sight of so many beautiful cars on display was enough to take any car lovers breath away. We would like to thank the Milton Ulladulla Vintage and Classic Car Club for organising such a fabulous event. We thoroughly enjoyed it!